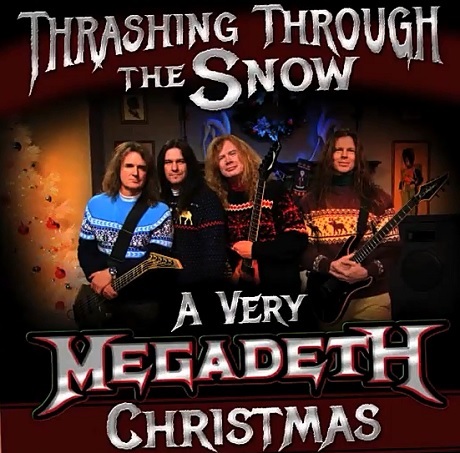 The worlds of Christmas music and heavy metal are super colliding all because of Big Four favourites Megadeth, who recently promoted a most headbanging holiday season on Jimmy Kimmel Live with a fake LP dubbed Thrashing Through the Snow: A Very Megadeth Christmas. The comedy sketch offers up a couple chuckles, whether it's just seeing Dave Mustain and co. kick it in their ugly Christmas sweaters, or the faces of some kids that clearly don't think the classics need to be dialled up with distortion. On top of ominous blasts of "Do You Hear What I Hear?" and "Frosty the Snowman," we also get a duet between Mustaine and Jenny Lewis, which the latter abandons for fear of her safety. Peep the snowy snicker-fest down below or, as the band allude in the video, Santa will kick you in the throat.